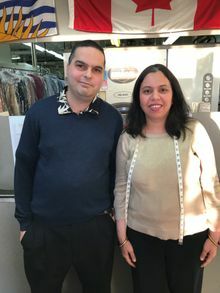 For years, residents in Maple Ridge and Mission have trusted Meadows Cleaners for premier dry cleaning services. Trust your fine garments with us! We use EcoSolv® dry cleaning fluid, which allows us to clean your precious garments with less heat. This unique cleaning method ensures that all material and any beading or sequins will remain undamaged. Our state of the art equipment is also gentle on your clothing! Meadows Cleaners is British Columbia’s trusted source for professional wedding dress dry cleaning. After your wedding dress is cleaned, we’ll invite you to visit the store to inspect it. Only when you’ve determined that your dress is completely cleaned (and all repairs have been made to your satisfaction) will we box it for you to store safely. We’re honored to help you preserve your wedding memories! Read a testimonial from one of our satisfied customers below. Meadows Cleaners, with their friendly attitudes, experience and attention to detail, are amazing! They exceed our expectations every time. They are simply the best! Meadows Cleaners’ alterations department is managed by Tanaaz. We’re proud to have a seamstress on duty 6 days a week. We do all kinds of alterations and repairs fast! We can even work on your zipper hems! 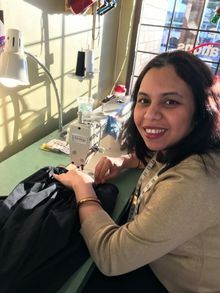 Our Seamstress, Tanaaz, is available to help you 6 days/week! We would be happy to serve you from either location regardless of drop off location. Advise us at time of service.